The Chlann Mhic-Ghille-Mhuire, meaning "Devotee of St. Mary" or Morrison clan is said to be Scandinavian in origin, supposedly descending from the natural son of the King of Norway who was shipwrecked of the shores of Lewis. This is the Morrison clan whereas the Morrisons of the Central Highlands, "sons of Maurice", and the Morrisons who descend from the O'Muirgheasain bards from Ireland who settled in Harris have no connection with the Hebridean clan of Lewis. The Morrison chiefs once held the hereditary office of Brilheanh, brieve or judgement, under the Macleods from whom they held Habost in north Lewis. The first recorded Morrison is Uisdean of Hugh who lived in the 16th century, a contempory of the last Macleod of Lewis, Roderick, who was chief till about 1595. He is said to have incurred their wrath when he betrayed Torquil Dubh Macleod, who was beheaded by the Mackenzies in 1597. The Morrisons consequently had to seek refuge on the mainland and about sixty families of Morrisons are said to have settled in the vicinity of Durness in the Mackay country, accounting for the similarity of the Morrison and Mackay tartans. They lost the hereditary brieveship of Lewis in 1613 when they resisted the takeover by the Mackenzies, and by the 19th century it became impossible to even trace the line. A branch of the clan, the Morrisons in Pabbay of Harris were the hereditary smiths and armourers to the Macleods of Harris. John Morrison of this family was a celebrated poet of the 19th century. The Morrisons of Ruchdi in North Uist are descendants of the Morrisons of Pabbay and on petition of the Lyon Court were reinvested in arms as the chiefs of Clan Morrison. The commonly used phrase �Clan Morrison� refers to the assimilation of numerous Morrison families across Scotland who have no common origin or shared history. The Morrisons were never a clan in the same way many of the famous highland families became known. Historically the name Morrison was first recorded in recognisable form in the fifteenth century and and can be found in many early Scottish records such as the Aberdeen and Edinburgh Burgh Records . The list of spellings of the name Morrison in the historical documents of Scotland have been transcribed into the modern spelling of Morrison from such variations as Morison, Morisson, Morcion, Morisone, Morsion, Moriston, Moryson, Morrieson, Morriceson, Morishon, Merson, Mollisone, Morason, Morzon, Moorison, Morisoun, Moresoun, Marrson, Murrion, Murison, Muirison, Murieson, Murrison, Muresoun, Muirsoun, Murson, Murescun, Muryson, Mwryson and no doubt many other phonetic synonyms or Anglicised adaptations. The name is most probably of Anglo-Norman origin. The generally accepted theory suggests it is a patronymic form of either Morris to become son of Morris or Morrison, or similarly More or Muir (from the European origin Maure or Saracen) to become son of More or Moreson or son of Muir or Muirson. According to Mitchell-Gill �Of the five entries in the Lyon Register, to families of the name of Moir or More in Scotland, all are connected with Aberdeenshire, and bear the three Moors� or Saracens heads. The name of Morison in Scotland bears azure three Sarcens� heads, conjoined in one neck proper, the faces looking to the chief, dexter and sinister sides of the shield� . The earliest historical reference to the spelling comes from Yorkshire in England as �Ricardus Morisson� in 1379 . The earliest Scottish recording is 1429 for �Arthuro Morison domino de Darleith� . Aberdeen Burgh records of 1440 cite �Morison, Angus, of Kynkardyn� , and in 1443 the name �Gothra Morison� is cited in the Rental Books of the Cistercian Monks of Coupar-Angus . The Clan Buchanan has a fascinating unsubstantiated historical connection to the origin of the name Morrison in the Strathern district where a �Morrison� family is said to originate from an illegitimate son of the Maurice, the 10th Laird of the Buchanans, named Arthur MacMaurice in the late 1300s . By 1854 the standardisation of vital records in Scotland saw the many variations of the spelling become �Morrison� although there were some families who preferred to use a single �r� spelling. The difference in spelling bears no special significance, just as in the spelling of Ker or Kerr, it simply became a matter of family preference. The name Murison is a surname in its own right, however there is a strong connection between this family and the Morrisons through the family crest and instances where the name became an alternative spelling or was changed to Morrison in family and official records. There is a popularly held myth that the origin of the name Morrison in Scotland comes from the Isles of Lewis and Harris. However, the reality is the name Morrison only came to these Isles about 1640 when a family associated with the Lewis Brieves known as �McBreif� or �Clan na Breitheamh� adopted the name �Morrison� when one of this family, the Rev Donald Morrison, was appointed minister of Barvas . The early history surrounding this family suggests they were involved in treachery and great bloodshed between the waring factions of MacLeods and MacKenzies to the point they were hated by all men . The practice of adopting a new surname was relatively common in the 1600s and 1700s, particularly amongst Scots who migrated from the Isles and Highlands to the Lowlands, either searching for work or escaping oppression . For many Lewis and Harris families, adopting a new surname was a way of disassociating themselves from their dishonourable behaviour during the clannish feuds that had dogged the Isles for most of the the sixteenth and early seventeenth centuries. A classic example of �rebranding� a surname in this period involved Rob Roy MacGregor who changed to his mother�s name Campbell when he was being pursued by the Duke of Montrose. Many other MacGregors were also forced to change their name when the clan was �proscribed� in 1603 . The name Morrison is often associated with the Viking occupation of Scotland, particularly with one named �Olaf the Black� (1177-1237) . This fabled Viking has no connection to the name Morrison. The names �Gillemorrie� and �MacGilleMhuire� are falsely claimed to be early Gaelic forms of Morrison descending from a Norseman named Leod. Morrison is not a translation of �MacGilleMhuire�. The McBreifs, MacGillieMhuires and a family of Irish descent named O�Mhuirgheasain are unrelated families who Anglicised their names to Morrison at some time in the seventeenth century . Another prominent fiction claims there was a migration from Lewis of some sixty �Morrison� families to the mainland region near Durness at an unspecified time who supposedly followed a Lewisman named Ay Mac Hormaid . He is described as being a Morrison. As the myth is told, �a handsome good-looking fellow�  named Ay Mac Hormaid was reputed to have married the Bishop of Caithness� illegitimate daughter or sister and been given lands around Durness. This myth bears a striking resemblance to MacKay history where according to the Blackcastle MS , Iye Mackay's son Iye Mor Mackay, 2nd chief of Clan Mackay married a daughter of Walter de Baltrodin, the Bishop of Caithness, in 1263, and was given 12 davochs of land at Durness . Whatever it was that that brought about the choice of the name Morrison for the Lewis and Harris families will probably never be known. It is a tantalising enigma that will no doubt vex the many adherents who have been led to believe the Morrisons originated in Lewis and Harris. The consequential effect of the name change meant that these families were now able to trace their family trees back retrospectively, that is, they also changed the names of their forebears to Morrison as well. Thus, according to Thomas (1876-78, p 508), �Cain Macvurich (Cathan Mac Mhurich), was the first Morrison in Lewis�. Had the families rebranded themselves Murich instead of Morrison then this same person would have been claimed to be the first Murich. This 17th century rebranding has created an historical distortion of extraordinary dimensions. The earliest family in historical Scottish records are styled �Morrison of Prestongrange and Dairsie" first identified in 1537 in Edinburgh when John Morrison and his wife Beatrix Hill began a dynasty that lasted until 1788 when the last male member of the family, George Morrison, died. The Prestongrange Morrisons purchased part of the Barony of Prestongrange in Haddingtonshire from the the Ker�s in 1609, then the full title in 1622 and held it until it was sold in 1746 following the financial ruin of Sir William Morrison. A cousin of the Prestongrange Morrisons, Sir George Morrison, bought the Dairsie estate in Fife from Sir John Spottiswood in 1646 and held it until 1692. The oldest continuing Morrison family in Scotland are the �Morrisons of Bognie". This family was established by Alexander Morrison and his wife Elizabeth Garden in 1635 when they acquired the lands of Bognie from Sir James Crichton in Aberdeenshire. This family has held continuous title to Bognie ever since with the current and 13th Baron being Alexander Morrison who succeeded his father Alexander Gordon Morrison in 2013. Another prominent Aberdeenshire Morrison family were known as the �Morrisons of Pitfour". The Morrisons have two tartans, one red and one green. Both tartans were reported by Charles Fergurson in 1879 as being �a beautiful red clan tartan, and a green hunting tartan� . The green is more correctly known as the �Society Morrison� tartan and is based on the MacKay sett with the red stipe replacing the green through the blue centres. There are contradictory and differing accounts about the tartan origins but none have any factual evidence to support them. Both tartans were officially recognised by the Lord Lyon in 1968 . Vert two in chief and one in base� , similar in design to that of the Morrisons of Prestongrange, Dairsie and Bognie. 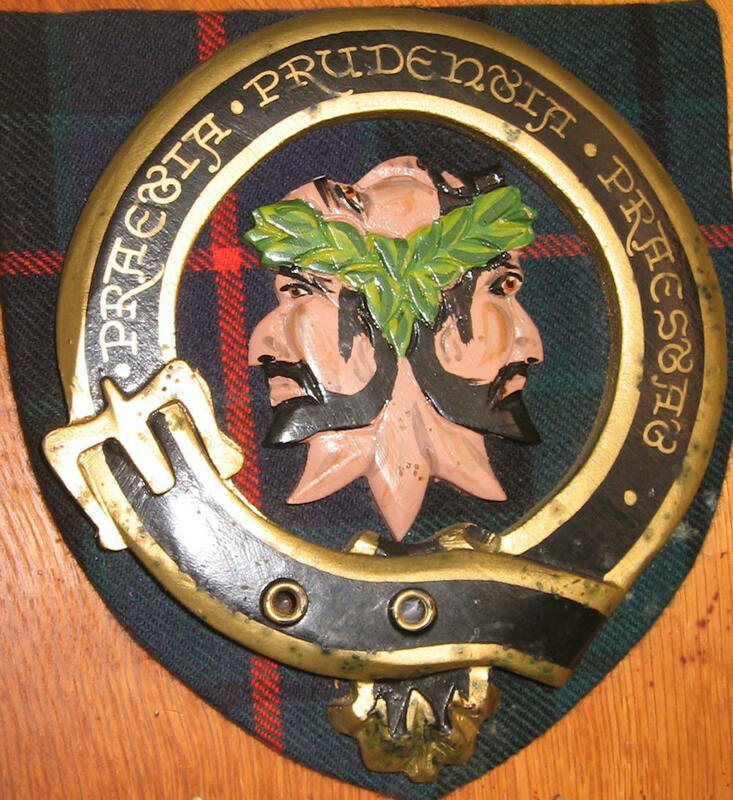 The motto attached to this crest is Pretio Prudentia Praestat (In Price Prudence Predominates). The Plant Emblem is Driftwood. Many Scottish descendants in overseas countries have expressed an interest in clan associations. In 1965 an application was made to the Lord Lyon to recognise a Morrison �Chief�. The person selected by the Lord Lyon was John Morrison from Ruchdi whose family traces back to the GilleMhoires of Lingay. The Morrison Chief�s motto is Teaghlach Phabbay.